Join host Dr. Natalie Crawford as she talks about what to expect with your first infertility consult. Learn when it is time for your infertility evaluation. Listen to what a fertility doctor thinks you need to know before you step into your first visit. What questions should you ask? What should you do to make the most of your first visit. Join host Dr. Natalie Crawford as she talks about quitting. Listen to her give you permission to say no. Learn that leaving something that is not right for you is not a failure. Identify what really matters to you and learn to appreciate your own worth. Listen to her challenge for you this week. Join host Dr. Natalie Crawford as she talks about egg freezing. Learn the basics about freezing your eggs. Listen as she discusses the truth about freezing your eggs and age, success rates, and options. Learn about the steps of the egg freezing process and what questions you should ask about if you are considering preserving your fertility with egg freezing. Listen ti her challenge for you this week. Join host Dr. Natalie Crawford as she talks about the fertile lifestyle and optimizing your natural fertility. In this episode, she will discuss natural fertility and your cycles, helping you understand how to optimize how chance of conception each month. Listen to how environmental toxins, diet, and supplements play a role in your fertility, both naturally and in the course of fertility treatments. Join host Dr. Natalie Crawford as she talks about understanding your own worth. Learn how you define your own worth by how you allow others to treat you. Discuss barriers to feeling worthy and believing in yourself. Listen as she discusses strategies to stand up or yourself and understanding that you do have more power than you realize. Join host Dr. Natalie Crawford as she talks about the basics of infertility. In this episode she is talking about infertility: what it is, what can cause it, and when you should see a specialist. Learn about the basics of a fertility evaluation and different fertility treatments. What are your questions about infertility? Listen to her challenge for you this week. Join host Dr. Natalie Crawford as she talks about the problem with perfection. In this episode, she is asking if you are a barrier to your own success. Are you setting yourself up for failure and sabotaging your own happiness? Learn about how perfectionism is the fuel for imposter syndrome and how to feel confident when you give your best effort and are not perfect. Listen to her challenge for you this week. 007: The Menstrual Cycle, Period. Join host Dr. Natalie Crawford as she talks about the stigma of the menstrual cycle and learn about how hormones control our body. Educate yourself about what is normal, what is not normal, and when you should be concerned, because you can't understand your fertility if you don't start at the beginning. Listen to her challenge for you this week. Join host Dr. Natalie Crawford with special guest, cardiologist Dr. Daniella Belardo, as they talk about plant based nutrition for women. Learn about heart disease and how you can modify your risks by controlling what you eat and how you care for your body. Learn more about how whole food, plant based eating can be incorporated into your life. Join host Dr. Natalie Crawford as she talks about the contingent life. Are you currently living a life of contingency and always waiting for the next thing to happen before feeling relief or happiness? Learn about delayed gratification and how to break out of the constant pitfalls holding you back from living in the moment. Listen to her challenge for you this week. Join host Dr. Natalie Crawford as she talks about gender bias. Hear stories from other women, understand how subconscious bias and subtle discrimination can have lasting impacts on women, and learn how to stand up for yourself and for others. Listen to her challenge for you this week. Join host Dr. Natalie Crawford as she walks you through her take on being a mean girl in recovery. In this episode, she discusses why women hold each other back, and join us in learning to put jealousy on the back burner and instead celebrate, promote, and amplify the success of others. 001: What is Your Goal? 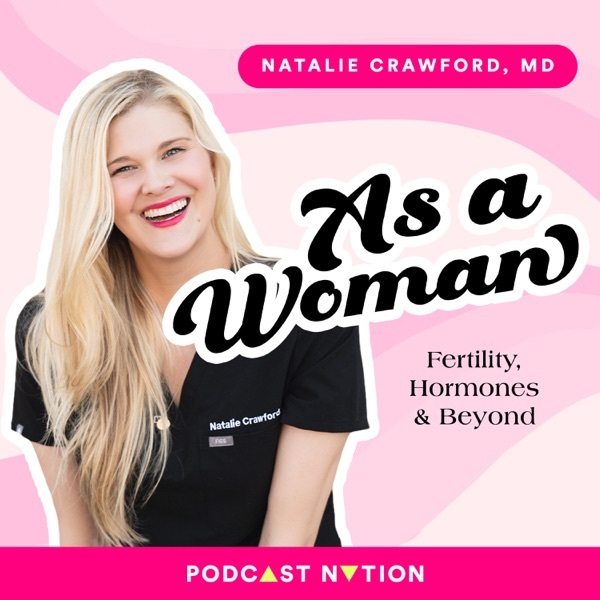 As a Woman is the podcast hosted by fertility physician Natalie Crawford, MD to educate and empower women. Each week learn about your health, your fertility, and how they relate to your true self. Become a part of the community fostering collaboration over competition while learning how to authentically find your voice and amplify others as a woman.